If you are wondering if traditional braces are cheaper than Invisalign, the answer is generally yes. Of course the actual cost of whatever option you choose will vary based on factors such as how long you will be wearing them, but traditional braces will generally run you less money than invisible aligners. The reason for this is that Invisalign is more high maintenance. With traditional braces, you will generally need to go in for adjustments about once every month. The orthodontist will adjust the wiring, which is fairly cheap itself, and that will be it. Because it is an older technology, it was designed so that keeping the braces fitted to your teeth entails a lot less work on the part of the orthodontist. In contrast, with Invisalign, you will need to go in about once every two weeks to get a new mold for your teeth. These molds will have to be changed each time you go in (since the aligners that you are wearing are shifting your teeth and they will not be in the same positions that they were in even two weeks ago). Once the impressions from your teeth are acquired, they will be sent to a lab that will make the actual molds that you will be wearing. The constantly changing molds will make it so that your teeth are constantly shifting closer to the positions in which you want them, but it also means more work for your orthodontist, and more resources consumed for everyone involved. As such, it will naturally be more expensive than traditional braces. Should I Choose Traditional Braces over Invisalign? If you are wondering about the merits of traditional braces versus Invisalign, the truth is that the best choice for you will depend on your specific situation. Traditional braces are cheaper, so this may be a consideration. However, the most important considerations in this decision would be more related to what your dental needs actually are. Invisalign is ideal for people who have minor problems with their teeth and just want some straightening done for aesthetic purposes, while traditional braces are probably the more effective route for those with more complex dental issues. Traditional braces are thought to work more quickly when it comes to straightening crooked teeth and closing gaps in the teeth. They work better for patients that need to fix their bites, and whose misalignments in the bite are causing them other problems, such as problems in the jaw due to teeth that are misaligned. 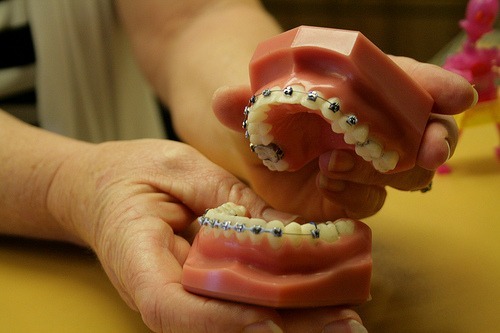 Traditional braces are suited for correcting problems such as crowded or crooked teeth (known in the orthodontic world as malocclusion), as well as abnormal bites. However, Invisalign comes with benefits of its own. Given that your tooth issues are not too extreme, this is a relatively efficient method. You would wear these clear trays on your teeth every day, typically at least 20 to 22 hours per day for the best results. You would be able to remove them while you are eating, and during other times as long as you are wearing them for the minimum amount of time per day that your orthodontist prescribed. This makes Invisalign a good option for anyone who would prefer to remove the aligners at times; obviously, removing and then reinserting would not be an option with traditional braces. Additionally, Invisalign would be a good choice for those who would feel uncomfortable in social situations if they were wearing visible traditional metal braces. It carries the benefit of being less obvious to the outside world, which is definitely significant for adults who are out there in the professional world and do not want to be seen with braces by their employers and coworkers. Additionally, Invisalign is less likely to affect a person’s speech than is a set of traditional braces. Also, unlike traditional braces, where people are typically told not to eat certain foods that could cause the braces to come loose, there are no food restrictions with Invisalign; because the aligners are removable, whatever a person chooses to eat will have no effect on the aligners. However, if they are looking to correct a significant problem in their teeth, Invisalign may not be the most effective choice, despite being considered more aesthetically attractive by many. If you are looking for Invisalign or traditional braces in Southington, look no further than Team Demas Orthodontics. Dr. Demas, Dr. Clauss, and the rest of the team at this practice are committed to helping people achieve the best and most attractive smiles that they can with whatever route that they choose for this purpose. They excel in technical aspects of orthodontics as well as patient care itself. They truly care about every one of the patients who comes in to see them, and they want to do the best they can for all of them. At this practice, you will find that the personnel know a great deal about modern orthodontic appliances, and anyone who has a need for non-extraction procedures, procedures having to do with adult orthodontics, and cases that most orthodontists would not treat will be able to find the help they need here. In working with each patent, they will take the following factors into consideration before coming up with a specific treatment plan (which sometimes means traditional braces versus Invisalign): growth and skeletal patterns, the positions of the teeth, the patient’s history in terms of medical and dental health, time required for treatment, the cooperation of the patient, and any treatment objectives and goals that have been discussed between the patient and orthodontist. If you are in Southington Invisalign and traditional braces are not that far away. Please feel free to visit the Team Demas Orthodontics website to find out more about this office and what they can do for you, or call them today at the appropriate number on the website (it will vary depending on the office which you want to visit) to schedule a consultation.